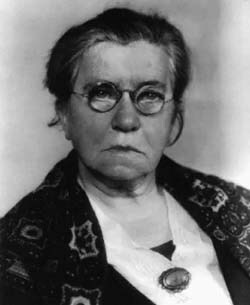 Emma Goldman was born on June 27, 1869, in Kovno, Russia, and emigrated to live with a sister in Rochester, New York, when she was fifteen. Her family's financial hardships had forced her to leave school and work in a factory, and her first work in America was as a seamstress in a clothing factory. Her political consciousness was shaped by reading (Cherychevsky, Kropotkin) as well as by first-hand knowledge of miserable working conditions and, most dramatically, by the violent outcome of the Haymarket demonstrations on behalf of the eight-hour workday (1886), following which four anarchists were executed for allegedly causing the deaths of seven policemen. In 1889, Goldman moved to New York where she first became a protégée of Johann Most, editor of an anarchist paper. From 1906 until 1917, she and her partner, Alexander Berkman, edited and published their own paper, Mother Earth. She wrote five books: "Anarchism and Other Essays" (1910); "Social Significance of the Modern Drama" (1914); "My Disillusionment in Russia" (1923); "My Further Disillusionment in Russia" (1924); "Living My Life" (1931). In her writing and public speaking, Goldman was a gadfly. She championed free speech, birth control, women's equality and labor unions. She said: "The history of progress is written in the blood of men and women who have dared to espouse an unpopular cause, as, for instance, the black man's right to his body, or the woman's right to her soul." Goldman was arrested and detained several times for her activism, but her most severe punishment, two years in prison, was for obstructing the draft during World War I. In 1919, she and Berkman were deported to Russia where she was able to witness the consequences of the 1917 Revolution. At odds with Bolshevik dictatorship, she left in 1921. She was permitted to re-enter the United States on a speaking tour in 1924. Marriage to a Welshman gained her English citizenship, and London was her base during the Spanish Civil War. She visited Spain several times, sought refuge for women and children displaced by the war, and spoke out against the forces of fascism. She died in Toronto on May 14, 1940, and is buried in Chicago, not far from Haymarket Square.